Heavy Handed feels like getting in on Chicago’s best kept secret. Rita Lukea, Jonathon Freund, and Tyler Ommen developed their debut LP over the past two years recording at Decade Music Studios and playing tirelessly at venues like Thalia Hall, word of mouth underground electro dance parties, and on festival stages. Rita opens the album singing “So come on baby walk through the door / I meant to let you in”. 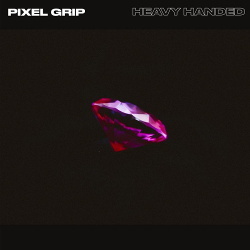 With Pixel Grip’s Heavy Handed it’s a synthpop paradise beyond heaven. Rita’s dynamic, boundless voice guides Jonathon’s lush analog synth arrangements and Tyler’s tight, irresistible drum grooves to form a sound that transcends any one place or time. Heavy Handed melds Chicago house, French electronica, and Hi-NRG while Rita dazzles with strong, clean pop melodies dipped in eroticism which at times boil over into ecstatic otherworldly babble. “Soft Peaks” is perfectly at home being played at a European discotheque, and “Diamonds” makes them a perfect pair with bands like Little Dragon or Holy F*ck.